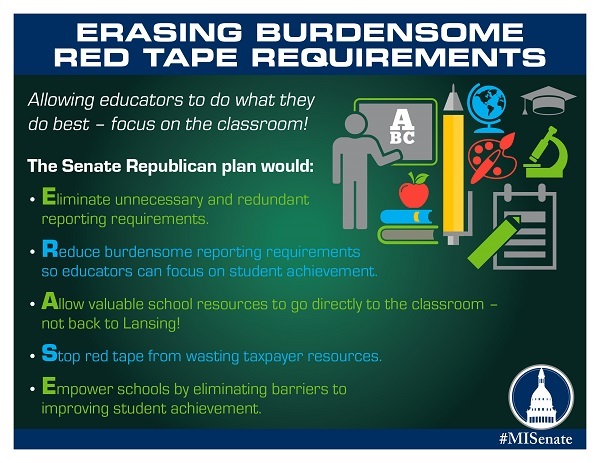 LANSING, Mich. — The state Senate on Thursday acted to reduce bureaucratic “red tape” by voting to end burdensome reporting requirements schools currently must complete. Each year, Michigan school districts are mandated to prepare and submit hundreds of reports to state and federal entities. These reports can be time-consuming and tedious to produce and are often redundant or even obsolete by the submission date. If signed, Senate Bills 754-767 would eliminate unnecessary and redundant reports and streamline the overall reporting requirements. Education reporting requirements are sprinkled throughout Michigan law — not just in the state’s education code. Unfortunately, there is no published comprehensive index to easily locate all mandated reports. These reports are costly, often taking a great deal of staff time and resources. The plan has received widespread support, especially from local district leaders. The bills, which were introduced in February and previously approved by the Senate Education Committee, now go to the state House of Representatives for consideration.